Posted on Thu, Feb 16, 2012 : 2:59 p.m. 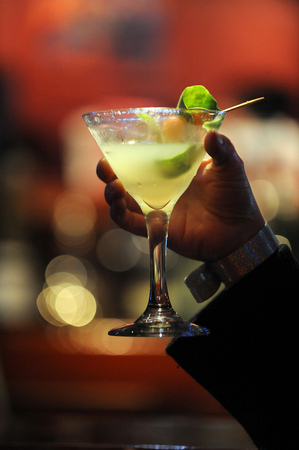 The "Annual Artini Martini Crawl" returns to downtown Ann Arbor on Friday, starting at 7 p.m. Participants will taste the carefully crafted creations at each of the participating locations and will vote on their favorite. Guests dressed to impress in Mardi Gras attire will be rewarded with gifts and prizes throughout the night. $45. Purchase tickets and see a list of partcipating establishments at www.annarborartcenter.org, or stop by the Art Center at 117 W. Liberty St., Ann Arbor. The "Annual Artini Martini Crawl" returns to downtown Ann Arbor on Friday. Sweet Honey in the Rock will bring its sweet harmonies to Hill Auditorium on Friday. 8 p.m. The group possesses a stunning vocal prowess that captures the complex sounds of blues, spirituals, traditional gospel hymns, rap, reggae, African chants, hip-hop, ancient lullabies and jazz improvisation. Tickets start at $10. For tickets or additional information, call 734-764-2538 or go online at www.ums.org. Tickets may also be purchased in person at the League Ticket Office (911 North University Ave., Ann Arbor). Hill is at 825 N. University Ave., Ann Arbor. 734-763-3333. The "Spinner's Flock 26th Annual Winter Fleece Fair" will be held at Beach Middle School in Chelsea on Saturday. 10 a.m. to 4 p.m. A wide variety of handspun yarns and handspinning materials in natural and dyed colors will feature Michigan grown fibers. Other finished goods made will also be available. There will also be equipment, tools, supplies, books and magazines for sale. Free admission. BMS is at 445 Mayer Dr. 734-475-7922 or 734-769-1657. www.spinnersflock.org. Celebrate "Mr. B’s Annual Birthday Bounce" at the Kerrytown Concert House on Saturday. 8 p.m. This year Mr. B and visual artist John Pappas have collaborated to provide an evening of boogie woogie and blues piano combined with visual art depicting some of the blues greats. $30/ Assigned rows 1-2; $20/ Assigned rows 3-5; $15/ General; $10/ Student. The KCH is at 415 N. Fourth Ave., Ann Arbor. 734-769-2999. The "25th Annual Storytelling Festival" returns to the The Ark on Saturday. 7:30 p.m. This year's tellers are New Hampshire-born Willy Claflin, Hungary's Zalka Csenge Virag, Kalamazoo's Alison Downey and Lyn Davidge. $20. There will be a kids' show on Sunday at 1 p.m. $10. The Ark is at 316 S. Main St., Ann Arbor. 734-761-1800. www.theark.org. Fri, Feb 17, 2012 : 1:01 p.m.
Fri, Feb 17, 2012 : 11:45 a.m. Sounds like tons of fun -- truly hope for great participation.